Actors Insite is in no way connected to the ongoing brouhaha in California concerning acting workshops that illegally charge actors to audition for casting directors. This has long been a simmering issue on the left coast where unscrupulous businesses and seemingly unethical casting directors hold in person “workshops” to meet and audition actors, for a fee. There was always a significant push back against “pay-to-play” from actors, and in 2009 a California law was passed, called the Krekorian Act. You can read about it here. It mostly aims to protect unwitting parents from signing up their children for talent management scams, but it also includes language that specifically identifies any “acting workshop” that charges fees for auditions. 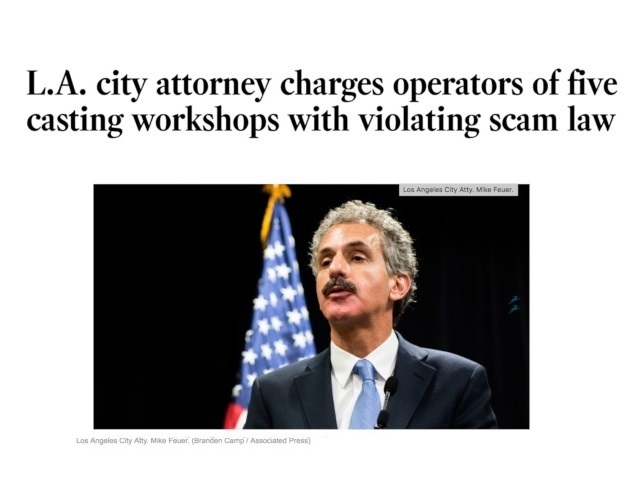 Recently, criminal charges were filed in LA against 25 workshop owners and casting directors for violating the Krekorian Act. Here at Actors Insite we give a standing ovation to any effort to eliminate scams from the business of acting. There have always been performer/employer scams and there probably always will be. Acting is an attractive career to millions of people, but the prospects of actually having an acting career are inordinately low. Clearly there has always been a ready made market for those who would profit by offering acting job opportunities for a fee, and an endless line of actors who are willing to pay for such opportunities, real or not. The California Krekorian act, imperfect as it may be, is at least a step in the right direction. We will watch this latest prosecution effort with great interest and hope that it will have an impact on the unethical pay to play biz in La La Land and elsewhere. Unfortunately, it’s also true that there are scammers and charlatans in the acting world for whom no legal remedy exists, i.e., coaches and gurus who profit not by offering employment opportunities but by selling “career development counseling”. The legit ones are far outnumbered by the phonies, and it can be very difficult to know which are which, until you’ve wasted some money. Our advice is always to be skeptical and do your due diligence. Slick talking promoters of their “indispensable” career guidance are usually blowing smoke. Some of them blow a lot of smoke. Actors Insite operates on the right side of that bright line that separates the scammers and charlatans from the legit educational and helpful services for actors. We offer an opportunity for actors, no matter where they live, to get valuable feedback from people in the industry, all online. Actors must submit video to apply for acting jobs today, but it can be very difficult to know whether the demo reel or self tape is adequate, put together well, too long, too short, competitive in the marketplace…a long list of uncertainties. Our industry professionals at Actors Insite watch the video and give their written, honest appraisal of what they think. There are other guidelines for those of us in the business of selling services to actors. The Casting Society of America is very interested in making sure that its members are not in the business of scamming actors by profiting off of actors for audition opportunities. Actors Insite is 100% in compliance with all CSA guidelines, and we have had hundreds of CSA members, including officers, on our site, helping actors improve their marketing materials. One of the ways we insure that we are in compliance with the CSA is by never advertising that any casting director or associate on our site is currently working on a particular project. CSA guidelines specifically, and emphatically, prohibit members from being promoted as “currently casting such-and-such”….etc. You’ve no doubt seen publicity from other sites and workshop owners who make those pronouncements anyway, but they are in violation of CSA guidelines when they do. We believe actors deserve the opportunity to get professional guidance as they navigate an incredibly difficult career path. Success in acting has an often mysterious, always subjective component that other performing arts careers don’t. It can all be so inscrutable, especially if all you have to go by is the tea leaves at the bottom of your cup. Knowledge is power in all things in life. In the acting world, knowledge of how your marketing efforts are impacting those who’s job it is to make decisions affecting you, is the power to give it your best shot.